It is our great honor to invite you to the 8TH Saarc ENT Congress, which will be held from Dec 19 – 21st at Sheraton Hotel Karachi Pakistan. Under the energetic guide of the Saarc ENT Societies, the groundbreaking scientific program will remain faithful to the pattern established in past, while incorporating innovative new elements and technology to provide a lively and compelling educational experience. For those seeking to expand their knowledge of the field and learn about the most up-to-date advancements and discoveries, the 8TH Saarc ENT 2013 Congress cannot be missed. We are also planning special social and tour programs which will give participants a wonderful taste of our unique culture to entertain you and your family during and after the Congress We are filled with great excitement and anticipation for what is sure to be an unforgettable and valuable experience. Distinguished scientists will participate in the Congress, thus giving us their views and experiences on the latest developments on topics of great interest for us all. We invite you to share this knowledge with researchers and clinicians of international scientific reputation. Current state of the art information will be provided through lectures, plenary sessions and presentations from recent research by experts in the field, along with the opportunity to take part in hands-on experience through various sessions and workshops. It is our sincerest hope that, as in past Congresses, 8th Saarc ENT Congress 2013 will bring all of us together to share in the common goal of advancing and developing the field of Otorhinolaryngology-Head and Neck Surgery With tremendous support from the Pakistan Society of Otorhinolaryngology-Head and Neck Surgery (PSORL) The organizing committee will deliver the most dynamic and invigorating congress to all of you. 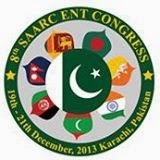 We are filled with great excitement and anticipation for what is sure to be an unforgettable and valuable experience It is our sincerest hope that, as in past Congresses, 8th Saarc ENT Congress 2013 will bring all of us together to share in the common goal of advancing and developing the field of Otorhinolaryngology-Head and Neck Surgery.